MPL expands it's MIP* Concept with a PowerPC solution. The new product called MIP405 is equipped with the highly integrated embedded PowerPC processor from IBM (PPC405GP with 375 DMIPS at 266MHz or PPC405GPr with 608 DMIPS at 400MHz). The MIP405 offers industrial specialties like: 4 serial and 2 USB ports,2 44-pin IDE I/F, a 10/100 Ethernet, PC/104 and PC/104 Plus expansion connectors and, and. The MIP405 can be equipped with up to 128MB on-board soldered SDRAM (ECC support), up to 4MB on-board soldered Flash plus in addition over the multi purpose socket SRAM, EPROM, and Flash modules. The MIP405 comes with the open source U-Boot loader. Various boot sources are available (USB, IDE, FLASH....) Also a Linux distribution is available for the MIP405. RT OS BSP are in preparations from several suppliers. For more information just get in touch with us. The MIP405 is available 0°C to +60°C and optionally for –40°C to +85°C without the need of a heat sink or a fan. Also depopulated or custom versions are available. Special efforts have been taken for the quality of the components and their long term availability as well as the low power consumption of the system (down to <3 Watts). All interfaces are ESD protected according the latest know-how. The MIP405 can be operated with 5VDC. 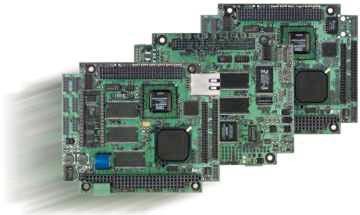 The PC/104 board can be expanded with any PC/104 & PC104+ expansion board. Packaged development Systems are available from stock with bootloader an/or Linux distribution. MPL offers on request professional Engineering and Consulting support for the HW and SW.
All these features and its reasonable cost, make the MIP405 the ideal solution for any application where a flexible, rugged long term available complete Industrial PC is needed. All MIP products can be ordered according to the customer requirements and needs.